Are you ready for the one? 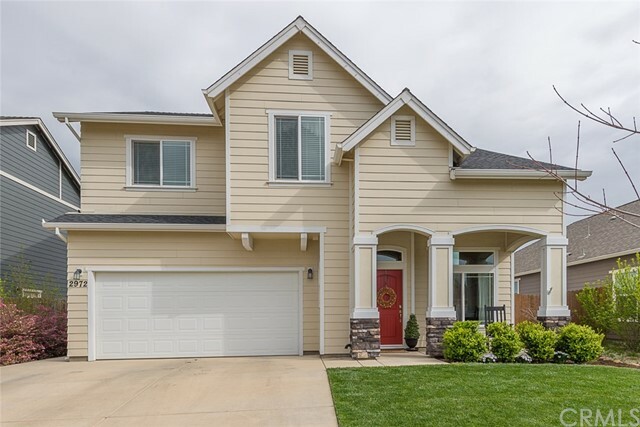 Located in one of Chicos newest subdivisions, with storybook curb appeal, this newer constructed home truly has it all. Grand two story entrance leads to the formal living and dining area, laid with laminate hardwood and half bath for guests. This open floor plan continues by flowing into a stunning kitchen that overlooks a SECOND living space- offering plenty of room for entertaining. Kitchen showcases beautiful wood cabinetry, granite counter tops with peninsula bar seating, stainless steel gas appliances and pantry. Upstairs you will find two full bathrooms, laundry closet and four bedrooms, including a luxurious master. Master suite includes a dual door entry and granite dual vanity ensuite with privacy toilet, walk-in closet, glass surround shower and soaking tub overlooking the perfectly manicured yard. This backyard is worthy of HGTV magazine- truly an entertainers dream. Fully cross fenced with a separate shed, rocked fire-pit area, pergola covered patio, pristine lawn and bordered planting areas. Attached two car garage, dual pane windows and paneled doors throughout. This home sits within a clean, well kept neighborhood minutes from shops, restaurants, movie theaters, and Trader Joes. If you are ready for your next dream home- this is it! Listing Provided By Hobie Jensen of Parkway Real Estate Co.